New American Library, 9780451234810, 378pp. In this far-reaching study, Peikoff identifies the three methods people use to integrate concrete data into a whole, as when connecting diverse experiments by a scientific theory, or separate laws into a Constitution, or single events into a story. The first method, in which data is integrated through rational means, he calls Integration. The second, which employs non-rational means, he calls Misintegration. The third is Disintegration which is nihilism, the desire to tear things apart. 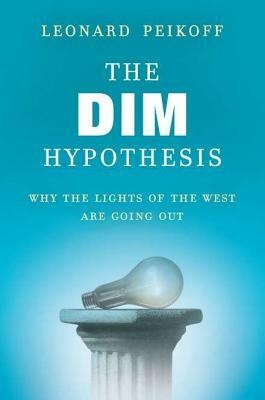 In" The DIM Hypothesis" Peikoff demonstrates the power of these three methods in shaping the West, by using the categories to examine the culturally representative fields of literature, physics, education, and politics. His analysis illustrates how the historical trends in each field have been dominated by one of these three categories, not only today but during the whole progression of Western culture from its beginning in Ancient Greece. Extrapolating from the historical pattern he identifies, Peikoff concludes by explaining why the lights of the West are going out and predicts the most likely future for the United States. Leonard Peikoff is universally recognized as the pre-eminent Rand scholar writing today. He worked closely with Ayn Rand for 30 years and was designated by her as her intellectual heir and heir to her estate. He has taught philosophy at Hunter College, Long Island University, and New York University, and hosted the national radio talk show "Philosophy: Who Needs It."